You may want to enjoy music with winter sports, but it can be hard to find headphones for snowboarding that are up to the challenge. Headphones for snowboarding must be comfortable and secure enough to withstand jumps, twists, and flips — and preferably rugged enough to keep working if you drop them. The best headphones for snowboarding deliver clear sound quality while limiting the amount of background noise – the sound of a board scraping on the snow can be pretty loud. Of course, there are other aspects to consider (Source) when buying headphones, like whether you want them over your ears, inside your hat, or with the ability to pair with your phone. Here are our picks for the top headphones for snowboarding. 7.4 Do the Headphones Need To Be Waterproof? Rather than have a separate headset, why not just fit a sound system inside your exisiting helmet? If your helmet includes an audio liner, you simply drop the Outdoor Tech Wired Chips into the liner, and that’s it. They connect to your musical device through a rugged audio cable that should survive the most difficult of conditions. An in-line microphone is included allowing you to take calls without having to hold anything to your ear, and without you having to take your helmet off. 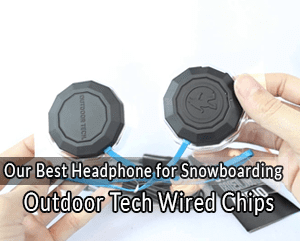 The headphones are sweat and water resistant, even if you’re snowboarding in very cold temperatures – the Outdoor Tech Wired Chips are the best headphones for snowboarding in temperatures as low as -20C/-4F. Complete with a carry pouch and stickers, these headphones are safe, secure, easy to install, easy to use, and include features to make your life easier and your snowboarding more fun. If you’ve been on the slopes awhile, you’ll have noticed a proliferation of beanies. Fashionable and functional, beanies keep your head warm without sacrificing too much style. While you could wear a regular beanie with a set of headphones, this is a set of headphones built-in to a beanie! The material is soft and comfortable, featuring a premium double soft knit to provide maximum comfort. Because of the stretchable nature of the beanie, it will fit well and won’t slip off your head – and one size fits all. The beanie itself is fully washable as the headset is removable with use of a zipper and Velcro. It can be removed or reinstalled in seconds. As far as the sound goes, the speaker drivers are created to reproduce sound well, with balanced deep bass and clear treble. The headphones connect to your device via Bluetooth wireless technology and will connect to most modern phones, tablets, and other devices. A small control panel sits on the outside of the beanie allowing access to volume and play/pause controls, while a built-in microphone allows you to take hands free calls. The headphones are powered by a rechargeable battery which is charged viad a MicroUSB cable. A fully charged battery will give around 7 hours of hands-free calling and 5 hours of wireless music. The Bluetooth connection can work at a distance of up to 33 feet. The Senseo Sports earphones have two safety features to ensure your ears are protected while snowboarding. A large block in front of the earpieces help prevent the earphones being pushed too far into your ears, while over-ear hooks keep them safely in place. 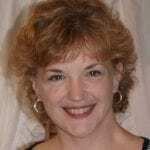 Though wireless, a wire connects the two earpieces behind your neck, making it much harder to lose them than if they were completely separate. Wireless connectivity is powered by Bluetooth 4.1 CSR technology, which allows connection to two devices at once. The headphones are waterproof and the advanced battery allows playback of up to 8 hours of music on a 1.5 hour charge. Over-ear headphones, or earcups, often produce some of the best quality sound due to the size of the speaker driver that can be included. These Skullcandy Lowrider Headphones include high-quality 40mm drivers, which give exception sound quality. These wired headphones include a microphone, making it simple to listen to music or take calls. The inline controls are compatible with the iPhone and most other smartphones, letting you answer calls and control the music with a play/pause button. 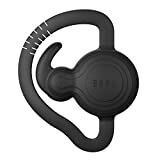 Comfortable to wear with super-soft ear cushions, the connecting band between the headphones can be worn low, making it possible to wear these headphones with certain helmets. The headphones fold down for transport and storage, making them convenient to carry around and not necessarily have to wear them the whole time. The BONX Sports Earbuds are unlike the other headphones in our round up. They are individual earbuds, one for each ear, with no connector in-between. This might make them easier to lose than other headphones on the list, but they have a few tricks that might make them worth a look. Waterproof and shock resistant, they will serve you well while snowboarding. 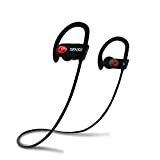 Including ear safety features to keep the earbuds in place, and featuring noise cancellation but allowing ambient noise, these headphones will keep you physically safe too. The earbuds connect to your phone via Bluetooth, and sound great without the use of wires. 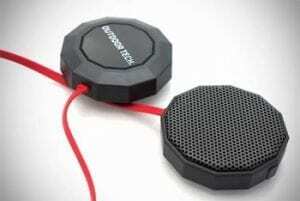 The BONX system is voice activated, so you don’t have to touch your phone at all. The major feature of these headphones is the Group-Talk option. You can create a private group with the BONX app on your smartphone, and talk to up to 10 friends at once. As long as your phone has service, you’ll be able to communicate with your group. You can use the communication system in voice-activated mode, or in push-to-talk mode, the choice is yours. As with other headphones, you can listen to music or make calls via the Bluetooth connection. While designed with an entirely different objective in mind, these headphones could prove very useful if you have a friend who tends to go missing on the slopes! Choosing anything for snowboarding can be a matter of style over substance, as brand names and appearance often matter more than the quality of the item. With regards to headphones, this shouldn’t be the case, and the choice made should reflect your own individual requirements. As you may be aware, there are many different types of headphones on the market today, in many different shapes and sizes. 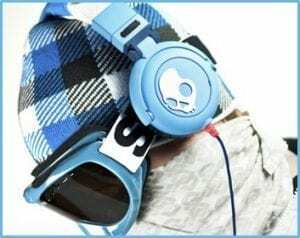 For the purpose of snowboarding, it is generally best to avoid in-ear headphones (also known as earphones or ear buds) as there is a potential health risk associated with them. While they may be the best for dampening external noise, their in-ear fitting could cause problems in the event of an accident. It would be quite easy for the earphones to be pushed further down the ear canal than is safe, potentially damaging the canal and the ear drum. This would be very painful, and could cause loss of hearing and permanently affect your ability to balance properly – something that is vital when riding on a snowboard. This risk can be lowered by using ear buds with external fixings to prevent ingress into the ear. Over-ear headphones are the safest option, whether traditional-style with a connecting band over or around the head, or less traditional where they are embedded inside a hat. Wireless headphones generally work on Bluetooth, and so your music source must support this – most phones do. Wireless may be safer as there are no wires to become tangled in, but the sound quality may not be as good as wired. Thick clothing can also impede Bluetooth signals, which may cause the sound to cut out. Wireless headphones also require a battery to work, whereas most wired headphones do not require a battery. The downside to wired headphones is of course that there is a wire that could become entangled, and if the wire is disconnected from the music-playing device, the audio stops. Some headphones are supplied as just the speaker component with an attached wire. 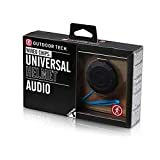 These mini speakers are designed to be installed inside a safety helmet, allowing you to continue to wear your safety equipment while listening to music. Larger headphones may prevent you from wearing a helmet, depending on the style of your helmet. If this is the case, in-helmet headphones are the safest way to go. Do the Headphones Need To Be Waterproof? Generally, no. Whilst being waterproof would be an added bonus, even falling into soft snow would not be the same as dipping the headphones in water. A light sprinkling should be fine with 99% of all headphones on the market – if anything, the headphones should be weatherproof rather than waterproof. One feature that some of the headphones include is a built in microphone. This allows you to take calls whilst wearing the headphones. Using a phone handset in the normal way whilst wearing a helmet, or even while wearing headphones that don’t include a microphone, can be tricky. You might need to remove the headphones, the helmet, or both. A microphone is not an essential feature, but it is a convenience that you might appreciate. While you’ll enjoy better sound quality with a set of isolating headphones, excluding too much of the sound of the world around you could be a problem. Sometimes it is sound that alerts you to danger – even someone shouting to you – and if you are unable to hear this warning, you may be putting yourself at risk. While sound isolation can be great, if you are going to be snowboarding around a lot of other people it is much better to be able to hear what is going on around you. Music should never be more important than your safety, and the safety of other people. For the total convenience of being able to wear a standard helmet and just add audio to it, the Outdoor Tech Wired Audio Chips are the best headphones for snowboarding as they produce excellent sound while keeping your head perfectly safe. 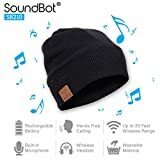 The Soundbot Beanie headphones make a good choice if you are looking for something more stylish, while any of the earphones will do a great job, and are safe to use in-ear while being involved in sporting activities. And of course, the BONX earbuds will let you communicate with your group even if you can’t see them, whilst also allowing you to track down your missing friends! Have you ever used headphones while taking part in an extreme sport? Comment below!